Located just to the north west of the town of Poole on the south coast, Ashdown Leisure Centre has all the facilities and experience you’ll need to ensure your event goes smoothly. Our main events space is our spacious and versatile Sports Hall that offers you the room to put on any number of different events. It’s ideal for indoor sporting events, as well as large celebratory occasions, while it can also be used for corporate events such as meetings and awards ceremonies. Secondly, we also boast a 200 spectator capacity athletics track, which is frequently used for outdoor sporting events and local athletics meets. The centre is within easy reach of Poole and its various ferry services, as well as being just a nine minute cab ride from Poole train station, while we also boast a good-sized car park for all your visitors. 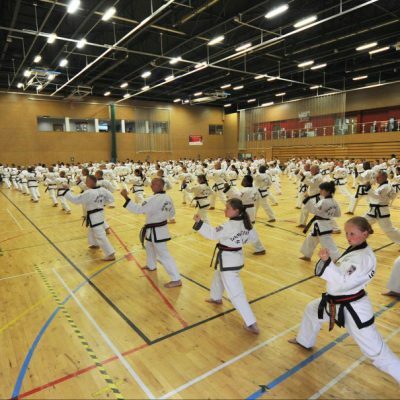 The large sports hall features everything you’ll need to help your event go smoothly. The amount of space on offer and the versatility of the room itself means it’s ideal for all sorts of different sorts of events. Alongside the tack itself, there are facilities for all the field events – including hammer, discus and javelin throwing, as well as pits for the triple and long jump. This really is the perfect place to hold any sort of athletics meet.